Extract and Convert Microsoft Outlook Email: Expanding Microsoft Outlook's Limited Export Capabilities. Expanding Microsoft Outlook's Limited Export Capabilities. MessageExport by Encryptomatic LLC is an add-in for Microsoft Outlook that makes it possible for you to transform Outlook email in powerful ways. We made this one minute video to help you begin using MessageExport right away. It's as simple as choosing an export format, selecting the emails you want to export, and then clicking the "Export" button. MessageExport can transform your Outlook emails (365/2019/2016/2010/2007) into many different formats, including PDF, TIF, GIF, MBOX, MHT, MTML, Text and much more. 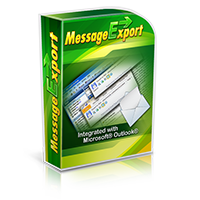 Download the MessageExport free trial today!